Monetary policy vs. fiscal policy: We're making progress. 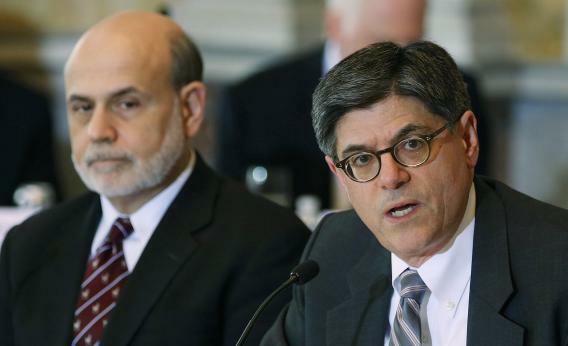 Treasury Secretary Jack Lew (right) speaks while Federal Reserve Chairman Ben Bernanke listens during an open session of the Financial Stability Oversight Council at the Treasury Department on Friday in Washington. Mike Konczal had an interesting weekend column arguing that the 2013 data we’ve had so far shows that the Federal Reserve can’t counteract the negative impact of contractionary fiscal policy. The more I think about it, the less convinced I am. Obviously to an extent this comes down to a question of baselines. I think there’s no question that the announcement of QE3 and the Evans rule has proved less potent than I’d hoped it would be and less potent than I’d thought it would be at the time. As a true believer in the power of the expectations channel, I thought the Evans rule announcement would likely push medium-term inflation expectations nearly up to 2.5 percent and spark a discernible acceleration of the economy despite tight fiscal policy. That hasn’t happened. 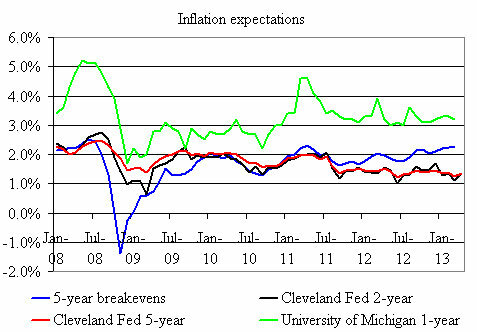 But Konczal’s argument that the Fed has failed to push inflation expectations up is based on exclusively reliance on Cleveland Fed estimates. Other measures from other surveys and bond spreads show a real and enduring QE3 impact on the expected price level. So how about real GDP? Well, according to the advanced estimate in the first quarter of 2013, real GDP grew at a 2.5 percent annual rate. That compares to 2.4 percent average growth in 2010, 1.8 percent average growth in 2011, and 2.2 percent average growth in 2012. Your Keynesian prior is presumably that the combination of a large tax increase on a small number of wealthy people, plus a small tax increase on a broad mass of wage earners, plus a sharp across the board cut in government spending would lead to slower economic growth than we’d seen in previous quarters. But based on the advanced estimate, we actually just saw an above-average quarter. Frankly, I hesitate to draw any sweeping conclusions from GDP data that’s still subject to revision, but as far as we can tell I would come down 180 degrees from Konczal’s position—we’re seeing that the Fed has successfully put a floor beneath the economy that allows the private sector to keep growing even in the face of government cutbacks and tax hikes. Cheers to Charles Evans, hero of the recovery. Does that mean austerity is wonderful and fiscal stimulus is bunk. No, it doesn’t. The standard critique of fiscal stimulus is that since the Federal Reserve has such a large role in steering the macroeconomy, monetary policy will offset any attempted fiscal expansion with deliberate monetary contraction. The plain text of the Evans Rule is a temporary suspension of this principle. If fiscal stimulus causes both an increase in real growth and an increase in the price level, the Fed will smile upon that conclusion as long as the impacts are modest. The Fed has given Congress a very effective parachute to counteract the fiscal plunge, but Congress could enact a jetpack that would be even more potent. Something everyone—but especially liberals—should think about is that if you look at overall fiscal contraction in 2013, the vast majority of it comes from tax increases, military spending cuts, and reductions in payments to health care providers. The message that this mix of tight policies must be reversed for the sake of the economy is, de facto, a call to shift policy to the right. I think it’s clearly true that monetary expansion can’t offset the short-term economic impact of laying off defense contractors, but liberal-friendly forms of fiscal expansion can’t do it either. It’s not as if the guy who was building an F-35 yesterday is going to be hired tomorrow as a preschool teacher. The military aspect of sequestration is half the dollars involved and probably more than half the GDP impact, but at some point you have to assess it on the merits. Many politicians claim to believe that a structural shift out of war production is a bad idea, but I don’t find that argument very plausible. Conversely, the evidence is overwhelming that World War II was a highly effective anti-unemployment strategy but obviously one wouldn’t wish for a massive military emergency merely to justify conscription-as-a-jobs-program.